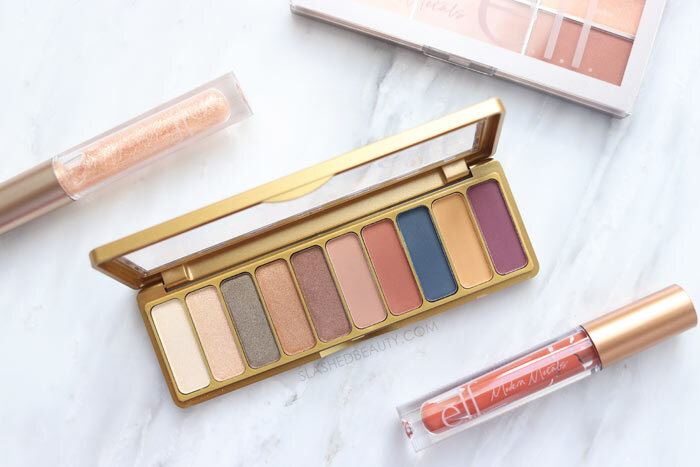 If you’re looking for a versatile fall makeup collection this season, the e.l.f. Cosmetics Modern Metals launch will probably catch your eye. The collection was a collaboration between the brand and select influencers to create a cohesive bundle of products that work well together to create multiple looks, and is inspired by the city of New Orleans. 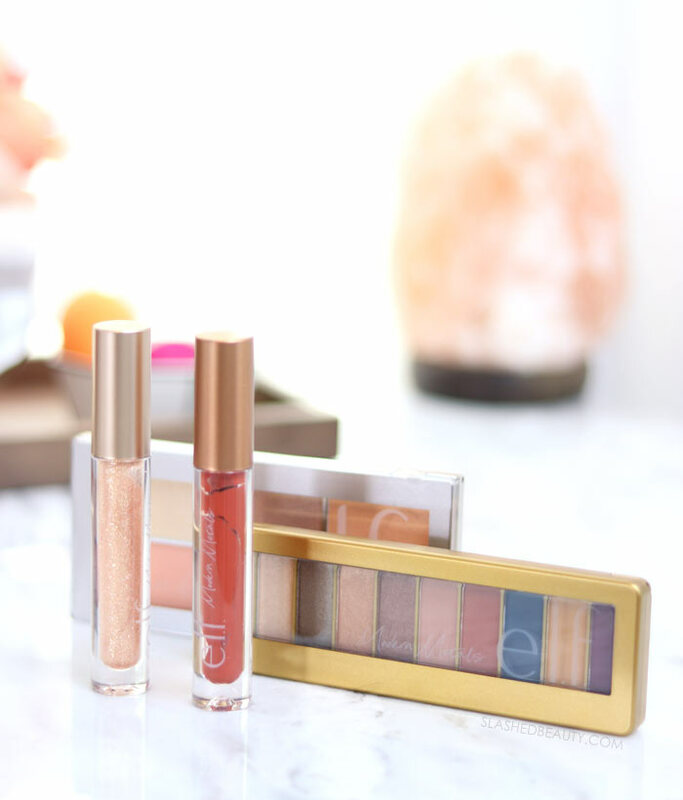 Each product in the Modern Metals collection can be purchased separately, though the brand is selling all four products together in a value bundle for $32. I’m actually sort of surprised but glad that e.l.f. kept this collection so small. Everything serves a purpose and adds something different to your makeup collection— there is no fluff for the sake of releasing product. The collection consists of a 10-pan eyeshadow palette, a blush & highlighter palette, a matte liquid lipstick and a glitter lip gloss. Despite the name, this collection actually isn’t overwhelmingly metallic. There’s a good mix of finishes to create a complete and balanced look. Keep reading to take a closer look at each product and see swatches. Watch the video at the top of the page for an overview of my thoughts plus a quick tutorial using the products. The e.l.f. Modern Metals Eyeshadow Palette ($12) is definitely the star of this collection. While the palette leans neutral, there are a few pops of bright color to inspire some creativity. 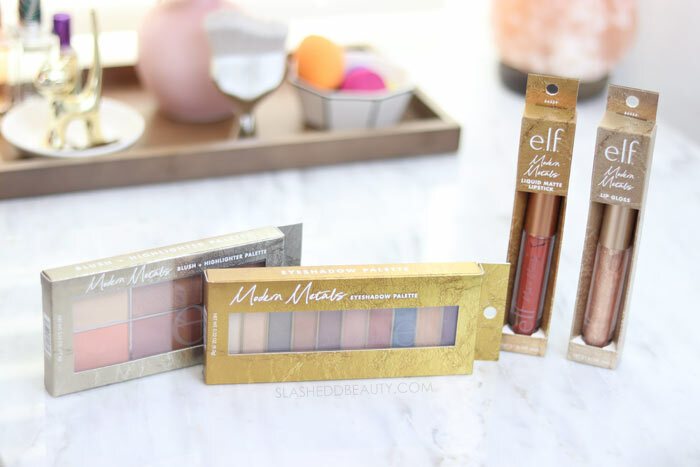 There is an even amount of metallic and matte shades, which I profusely thank e.l.f. for. 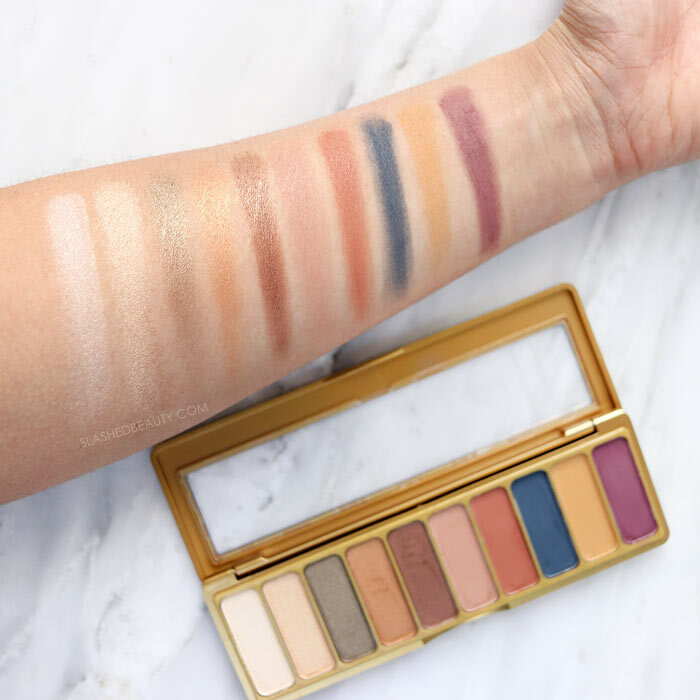 It would have been so easy for them to just release a fully metallic palette due to the theme of the collection, but they really gave us a product that can be used as an all-in-one for full, dimensional looks. What I also love about this palette is that the metallic shades can be used either wet or dry, but look great either way. The matte shades are smooth, pigmented and blendable… pretty much the same formula as the Mad For Matte palettes. Even the light shades show up well. I think my one and only complaint is that there are light and mid-toned shades but not too many deep colors to use for the crease or as liner besides the purple. It’d have been nice to have just one deep brown. I was surprised with how much I ended up liking the e.l.f. 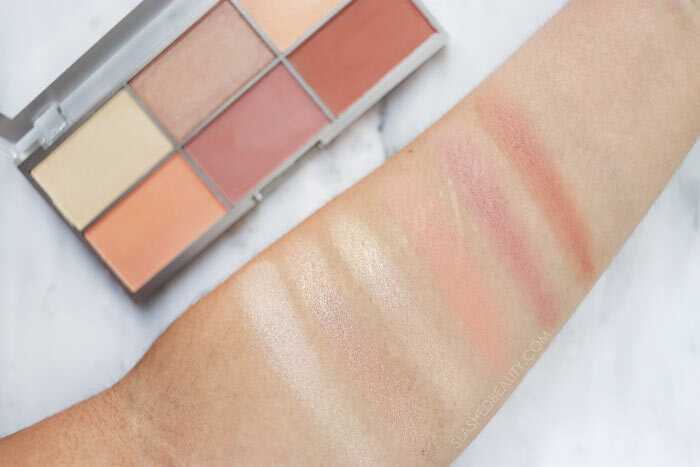 Modern Metals Blush & Highlight Palette ($12). Usually, I stray away from palettes like these because there are at least 1-2 shades that don’t work for my skin tone. However, this one is a medium girl’s dream! On deeper skin tones, I can’t say whether or not they’ll show up strongly, but they do have great color payoff. 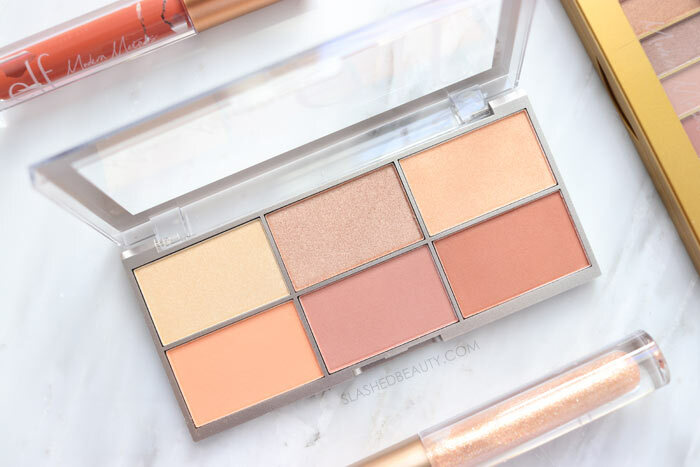 The palette includes three matte blushes and three highlighters, none of which are duds in my book! I am extremely happy with the highlighters, which have micro-fine shimmer and give off a reflective strobe effect true to the metallic theme. Both the blush and highlighters are made with primer in the powder’s formula to help them apply smoothly and maximize wear time. It was a little baffling to me to see that out of the two lip products in this collection, neither has a metallic finish! I mean, I’m not a huge fan of metallic lipsticks anyway but you’d expect it from a line called Modern Metals, am I right? Either way, the e.l.f. Modern Metals Liquid Matte Lipstick ($6) comes in one “universally flattering” terra-cotta shade that I’m loving for fall. The dusty burnt orange can be paired with neutral eyes to make a statement or with a full glam look. Now this is a truly matte lipstick, with the flat effect once it dries down. With that said, it also feels matte, despite having Vitamin E in the formula. It’s very slightly drying, so I do suggest exfoliating and moisturizing prior to application. 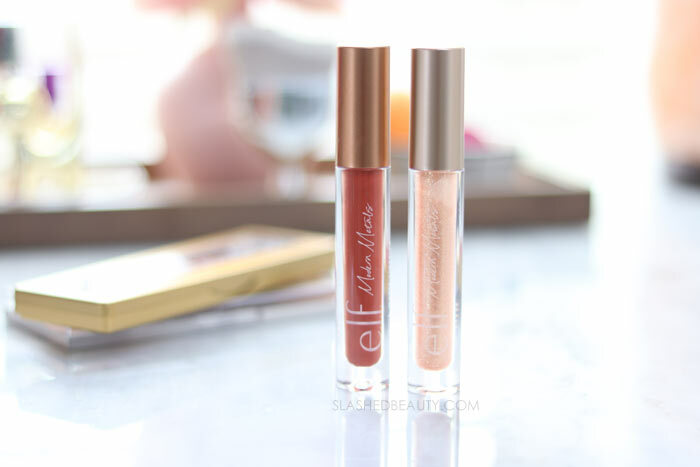 You may know that I’m not a huge lipgloss fan, so the e.l.f. 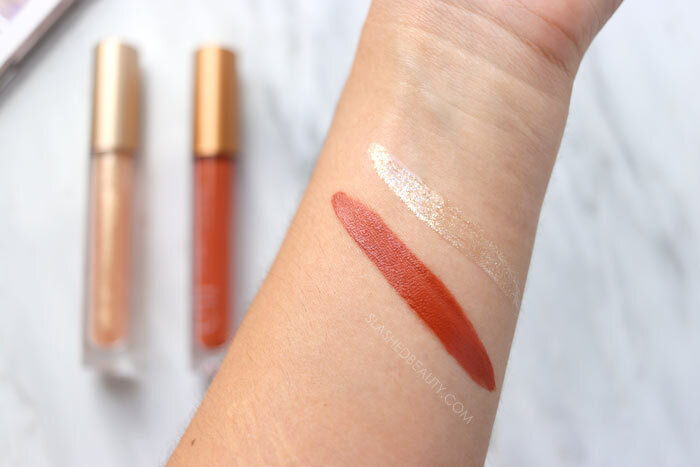 Modern Metals Liquid Gold Lip Gloss ($6) didn’t appeal to me all that much. It’s a clear gloss that is packed with champagne-gold glitter… have I mentioned I’m not a huge fan of glitter either? So out of the whole collection, this was my least fave but it does add a pretty effect over bare lips or you can layer it over the Liquid Matte Lipstick for a more glitzy look. Overall, I think this is a very well thought-out collection for fall that is a little bit different from the typical jewel tones and burgundy shades that tend to come out around this time of year. I think you can get a lot of use out of these products beyond this season, and for many different occasions, casual to glam. You can find the Modern Metals collection on the e.l.f. Cosmetics website. Are you a fan of makeup with a metallic finish? I’m not normally a fan of metallic finishes, but I love the eyeshadow palette and I love the terra-cotta shade. I want to buy the set for that shade, but I’m also a little confused as to why it’s not metallic given the name of the collection. I guess they thought that the glitter was enough? Thanks for sharing this I’m definitely adding the eyeshadow palette to my Christmas List.